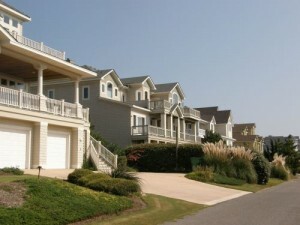 The Pine Island community in Corolla, NC provides a truly exceptional vacation setting. Winding along three and one half miles of gorgeous coastline and 5,000 acres of pristine protected marsh to the west known as the National Audubon Society Pine Island Sanctuary, Pine Island boasts some of the most luxurious vacation homes on the Outer Banks. One of the most sought-after communities, Pine Island is ideally situated at one of the narrowest parts of the northern Outer Banks. As a result, the community is less-densely populated and the beaches are less crowded than those in other north beach communities. Amenities include two pool facilities with baby pool, restrooms, showers, picnic tables, a jungle gym, outdoor tennis court, basketball court, and bike and jogging paths. Although many homes have private beach walkways, the community also has numerous beach walkways to give easy access to all owners and renters. The Pine Island Indoor Racquet & Fitness Center is located across from the community and is open to the public for daily or weekly fees. The documents provided have been compiled from sources deemed reliable and are accurate to the best of our knowledge. However, Seaside Management cannot be held liable for any errors or omissions. I know I said thank you yesterday but I wanted you to know, that in my whole career I have never had anyone give me as much information about a condo complex, send me all the information I needed to be up to date and knowledgeable, or anyone that took the amount of time that you did, to fill me in on everything that I needed to know. It was a pleasure talking with you and you are the best! Madonna VanCuren, Sun Realty, the "M&M Team"
Copyright © 2019 · Seaside Management · Website By Outer Banks Internet, Inc.